Is R2 right for me? Garnier Nutrisse Ultra Color R2, "Medium Intense Auburn," is the middle of the three Ultra Color red shades and gives hair a strong red reflect. It is best for anyone with natural hair between medium brown and black. For other options, explore our other two shades: R0 and R3. *For women with currently colored hair, there are special considerations for the color result you can achieve. Because of this, we do not recommend shade R2 for hair that has been previously bleached, highlighted, hair that is predominantly gray, or if you have previously colored your hair "Medium Brown" or darker. For more help, use our Shade Selector Tool to find the perfect shade for you! Nutrisse Colorant: Aqua/Water, Cetearyl Alcohol, Deceth-3, Propylene Glycol, Laureth-12, Ammonium Hydroxide, Oleth-30, Lauric Acid, Hexadimethrine Chloride, Glycol Distearate, 1-Hydroxyethyl 4,5-Diamino Pyrazole Sulfate, 4-Amino-2-Hydroxytoluene, Ethanolamine, Polyquaternium-22, Silica Dimethyl Silylate, Ci 77891/Titanium Dioxide, 5-Amino-6-Chloro-O-Cresol, Ascorbic Acid, Sodium Metabisulfite, Dimethicone, Pentasodium Pentetate, P-Phenylenediamine, Parfum/Fragrance, Carbomer, Vitis Vinifera Seed Oil/Grape Seed Oil. F.I.L. D36931/2. Fruit Oil Concentrate: Paraffinum Liquidum/Mineral Oil, Vitis Vinifera Seed Oil/Grape Seed Oil, Parfum/Fragrance, Tocopherol, Rosmarinus Officinalis (Rosemary) Extract. F.I.L. D25829/5. Rinse-Out Conditioner: Aqua/Water, Cetearyl Alcohol, Elaeis Guineensis Oil/Palm Oil, Behentrimonium Chloride, Pyrus Malus Extract/Apple Fruit Extract, Glycerin Parfum/Fragrance, Stearamidopropyl Dimethylamine, Niacinamide, Pyridoxine Hcl, Butyrospermum Parkii Butter/Shea Butter, Citric Acid, Olea Europaea Oil/Olive Fruit Oil, Saccharum Officinarum Extract/Sugar Cane Extract, Benzyl Alcohol, Chlorhexidine Dihydrochloride, Persea Gratissima Oil/Avocado Oil, Ribes Nigrum Oil/Black Currant Seed Oil, Linalool, Citrus Medica Limonum Peel Extract/Lemon Peel Extract, Ci 19140/Yellow 5, Camellia Sinensis Extract/Camellia Sinensis Leaf Extract, Ci 15985/Yellow 6. F.I.L. D35637/3. Nutrisse Developer: Aqua/Water, Hydrogen Peroxide, Cetearyl Alcohol, Trideceth-2 Carboxamide Mea, Ceteareth-25, Glycerin, Pentasodium Pentetate, Sodium Stannate, Tetrasodium Pyrophosphate, Phosphoric Acid. F.I.L. D12836/26. Rated 1 out of 5 by wannabered from okay color but did not dye entire hair I bought this because it says it works on dark base. I am Asian with very dark brown hair and I dyed with henna 5 months ago. Since my henna did not arrive on time, I decided to try this Garneir R2. I followed the instructions and watched video to learn how to apply. Although I covered my entire hair (my hair is around shoulder length) with the dye, only very top part of my head was dyed that I can see the color. The color is not the same or similar as the box picture but more purplish color. Since I had some gray hair more on the top or maybe new hair coming out, it dyed better on top? I am not sure why but for other part of my hair (especially the end of my hair) I do not see reddish color at all unless I go under the sun light. Now it looks very strange to have partially dyed hair having purplish red on the top and then almost black (my hair was dark brown with henna but now it became darker due to this R2). I would be happy or at least a little satisfied IF the color spreads evenly. I am VERY disappointed and sad with this result. The statement of the box and the picture are misleading. Rated 1 out of 5 by MsMady from Bleed I bought this product a 2nd time thinking maybe it didn't do something right the 1st time but i was wrong! This Dye bleeds so bad! The instructions say to rinse until the water runs clear but it never does! I guess now I'll have to find another product to use. 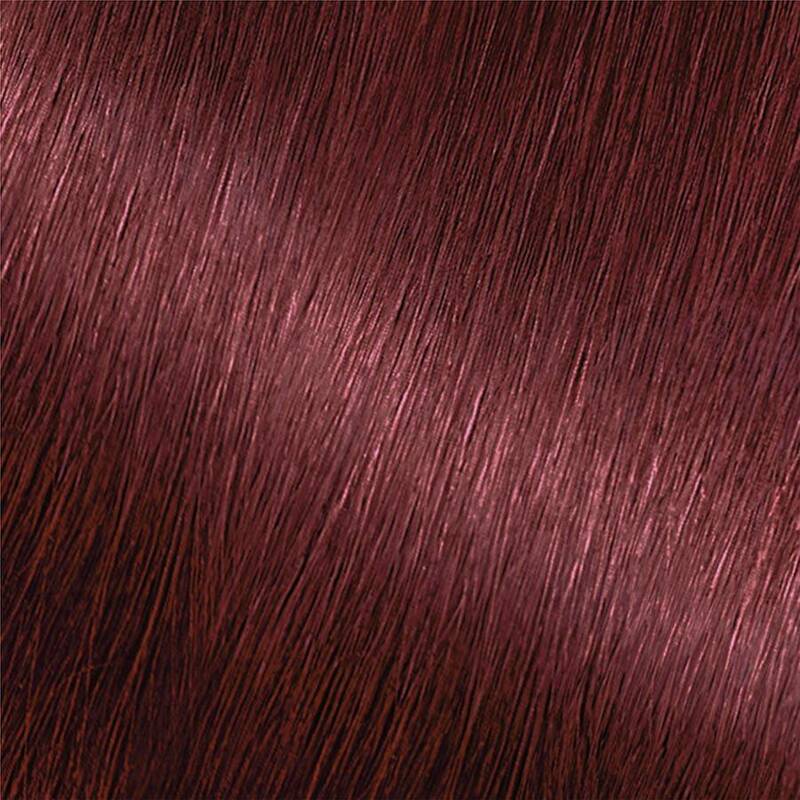 Rated 4 out of 5 by Pk Red from Great Color I have very dark brown hair which at this point in probably more grey than brown and have always loved the deep red auburn color. I tried several brands but several years ago I found Nutrisse R2 and have used it since. I love the color and keep a picture of the box on my phone to show all the woman that often stop me and ask how to get my color. I do find that it does as many call it "bleed". I keep 2 dark towels that I use just for my hair so not to ruin all of them. I also have found some color around the neck of my clothes especially the first week so i try to be careful and in the winter I make sure I wear a scarf. Even with that I LOVE the color and will continue to use R2. Rated 5 out of 5 by Kimani from Beautiful color I got this color and used it on my friends hair as a undertone and it turned out beautifully! her hair is naturally medium brown and I really like how it mixed with her hair. Her hair is very long and one box was enough. Rated 2 out of 5 by Mom of three from Bleeds Soo bad! I just bought 2 boxes and LOVE the color results but it's bleeding so bad. Ruined towels, shirts, and more. It's been 2 weeks and still bleeding out in the shower. Not sure if I'll be using it again. Rated 5 out of 5 by Rainkoz from Finally a red dye that looks red on my dark hair I have been trying for years to get my black hair this color red. I have gone to hair stylist and used other at home hair dyes and this is the first one to actually turn my hair red. I am stopped almost everyday by someone asking my what I use and getting compliments on my hair. Love love love this hair color! Rated 5 out of 5 by Heather311 from Long lasting This is the only box red hair dye I have found that gets great coverage AND does not fade.